Subscribe to comments with RSS or TrackBack to 'Ladson Inbox 4/25/16'. I think you may be selling Solis short. He is a former second rounder who is fully healthy for the first time in years and brings mid-90s heat. He could well be much more than a LOOGY. The Nats might also have another option if they would convert Reynaldo Lopez and his near 100 MPH fastball the way they did Felipe Rivero last year. But as long as the bullpen is getting the job done, there is no reason to make that switch yet. As for Robles, I wouldn’t shocked if he comes up mid-season as a 19-year old next year. 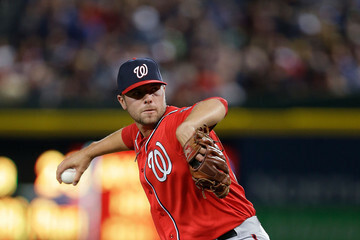 His OPS at Hagerstown is currently 1.044, or about 70 points higher than the last 18-year-old blue chipper who played for the Suns back in 2011 and was brought up to the Nats the very next season. I agree with Karl. Solis had the 5th best ERA on the team last year and it was his first year as a reliever at any level. Not including intentional base on balls that the pitcher doesn’t control, his K to walk ratio last year was 8.5 to 1 — this was 2nd on the team to only Max Scherzer. And, he did better against righties than lefties so he definitely is not a LOOGY. He is a bit blocked by Rivero and Perez right now but I am sure there are many teams that want a lefty that throws 95mph and can get both righties and lefties out. Maybe a trade would be in order. Gonna have to second what Ernie and Karl both said. I have been keeping an eye on the AAA bullpen, and it seems Solis far outshines the rest. Not only has he proven himself this year, but has also proved himself to be capable of competing at the big league level. A trade might be best for Solis, but we sure would be sad to see him go. I wouldn’t expect to see Solis traded this year. Regardless of which arm he uses to pitch, he is much more valuable to the team as bullpen depth right now, especially with Gott struggling with his K and BB rates. Someone is going to get hurt at some point, or perhaps Belisle will suddenly remember that he was a 36-year-old minor league free agent. Wow–I guess I was wearing my clairvoyant hat yesterday! I certainly hope i’m selling Solis short. And I gotta admit i was surprised he was the callup. Good for him; i hope he continues to succeed. I, and others, sometimes forget you don’t have to be right handed to get right handers out. If Solis can pitch multiple innings and isn’t just a matchup guy, then he can be just as valuable as Rivero. OK, I’m getting concerned. Not worried yet, but concerned. Other than Harper and Murphy (and MIA Ramos), NO ONE is hitting. Four of the five starters have looked great, all except the $210M one. Taylor doesn’t look ready for prime time and never should be allowed anywhere near the leadoff spot. And we’re about to start playing real teams, having frittered away nearly all of our April advantage. Solis was a starter until last season so supposedly could be stretched out. We’ll see. Not an auspicious start for him. Here’s a roster question: did the Nats burn den Dekker’s last option at the beginning of the year? Or was he down for too little time for it to count? In other words, does he still have an option left? Taylor and Espinosa do, but C-Rob doesn’t, and he really seems to have lost his mojo thus far this year. There are some interesting roster decisions coming when Revere is ready and Turner reaches May 29. To echo KW, wonder when’s the last time a team sports 7 sub-200 hitters in their line-up. KW – is the question whether they can send down MdD without exposing him to waivers? I am sure the answer to that is yes. Options work for the whole year, not individual trips to the minor leagues. So even if he was down too little for it to count this year, all that means is that they still have it and could use it to send him down again. If they used it for the first trip to SYR, they can continue to use it all year and bounce him up and down like a yo yo. Next year is when they would expose him to waivers if he doesn’t make the 25 man roster. The line up stuff doesn’t even give me a second thought. If someone was hitting and batting too low, that’s one thing but swapping out MAT for some one hitting comparably isn’t going to change the results. People need to start hitting, wherever they are batting. I was at the stadium today–ye gods what an awful game save for seeing another great start from Roark (I was lucky enough to be there last Saturday as well). The Phillies have the perfect formula for beating the Nats right now–contain Harper and that Nats can’t score. Period. Here is also where Rizzo’s monumentally stupid decision to bring up Turner last August just so he could sit on the bench is having a domino effect. Now Turner is being held down in AAA until May 29th strictly for service time reasons when the Nats desperately need a real leadoff hitter. I noted the huge difference between Taylor (and today den Dekker) swinging at the first pitch and managing to do nothing productive versus the Phillies leadoff hitter who battled every at bat and eventually scored the winning run in the 9th inning. Thankfully, Revere started his rehab assignment today and even collected a couple of hits. When you are swept at home by one of the worst teams ever it’s time to start thinking outside the box. Right now you have 7 automatic outs in the lineup. Sorry, Todd, wish I was wrong but Werth looks done. He gets a meatball to hit and can’ t do anything with it. Plus, he plays DH-quality defense. Getting nervous about Zimmerman too. A couple of albatross contracts. Dusty made some cornball cracks Thursday about how it wouldn’t do guys any good to bat them in other places in the lineup if they’re not hitting where they already are. Then he moved the black hole known as Espi ahead of Harper . . .
Like Bake, I’ve got nuttin’ to suggest with so many guys not hitting. I would at least try Murphy at 1, 2, or 4, anywhere where he might be able to help Bryce. Murph hit two balls on Thursday that would have been out if not for the saturated air and the wind blowing in. He’s been a great acquisition thus far. Also on the bright side, it was another terrific start by Roark. Gio looks like 2012 form. The only starter struggling is Max. But you can’t win if you can’t score . . . which seems like exactly what we were saying at this time last year. Revere was 2-3 with a run and an RBI in his first rehab game with Syracuse on Thursday. As FP would say, “He’s ready, call him up!” With Revere and Ramos back, things will look a little better. Who gets shipped out when Revere comes up? I really think that it needs to be Taylor, even though that would leave them short on RH bats on the bench. They would still have the one big on with Heisey. Taylor won’t find his swing while sitting on the MLB bench. Karl, you’re right but Rendon is young and can bounce back. Looks like Werth’s bouncing days are over. Hope I’m wrong. I love Michael Taylor but he needs to work on his hitting in Syracuse. I agree with sending Taylor down but I think that they’ll send MdD. It’s not only Taylor’s hitting; I don’t think his fielding is quite as plus as it gets discussed. He’s certainly not a problem out there, but his propensity to drop balls that his speed lets him reach turns him from a plus fielder to one a little Better than average. I have similar views on Espy’s fielding: good, but not plus. And that matters, if he (Taylor) is going to hit like this. MdD, while not having better stats, seems to see more pitches and put together better ABs, while producing about the same in the field, and he’d be my choice to stay. He doesn’t look as good as Taylor does when he is going well, but I think he’s more reliable right now. Rendon hasn’t had more than one hit in a game since 4/16 or an extra-base hit since 4/19. On a very positive note, though, he’s only struck out twice over the last nine games, so he’s making contact. By contrast, Werth has struck out seven times over the last five games. But he’s got to play. With Revere still out, there aren’t a lot of options. On a positive note for the offense, as good as the starting pitching has been, the bar for offensive need is set pretty low. But it does put a lot of pressure on the pitchers if they have no run support. Rendon hasn’t been right since his injury last year. My worry is that he’s the second coming of Nick Johnson, a very talented player who gets hurt a lot a takes forever to return to normal afterward. If the Nats go on to have a successful season, mark down 4/29 as one of the key markers along the way. It wasn’t as dramatic as the Uggla game around this time last year, but it was just as needed, trying to get a little mojo back at the start of a tough road trip. Another observation is that while STL has some good individual players, I’m not impressed with the overall package. I think the Cards are going to struggle even to make the wild card, a year after winning 100.